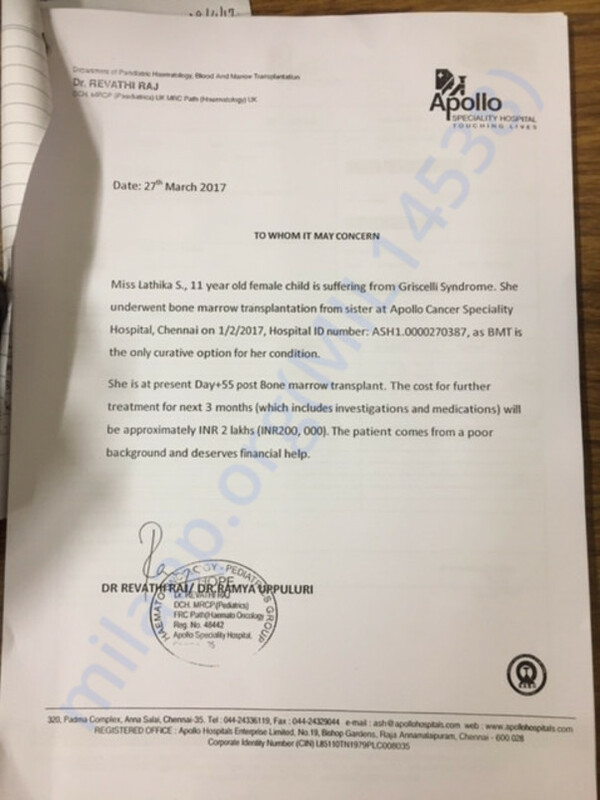 Miss Lathika S., 11 year old female child, is suffering from griscell Syndrome. She underwent bone marrow transplantation from her sister at Apollo cancer Speciality Hospital on 1/2/2017 as BMT was her only curative option. She is at present post bone marrow transplant. The cost for further treatment for the next crucial 3 month post-oprative phase is approximately INR 2 lakhs. The patient comes from a poor background. Her father, Silambarasan, a driver is now unemployed and devoted to taking care of Lathika, as he is unable to go to work. The patient is in dire need of financial help to get her through this treatment. Lathika passed away on Sunday (August 6th). Our hearts go out to this brave child who endured so much pain and fought so hard for her life. 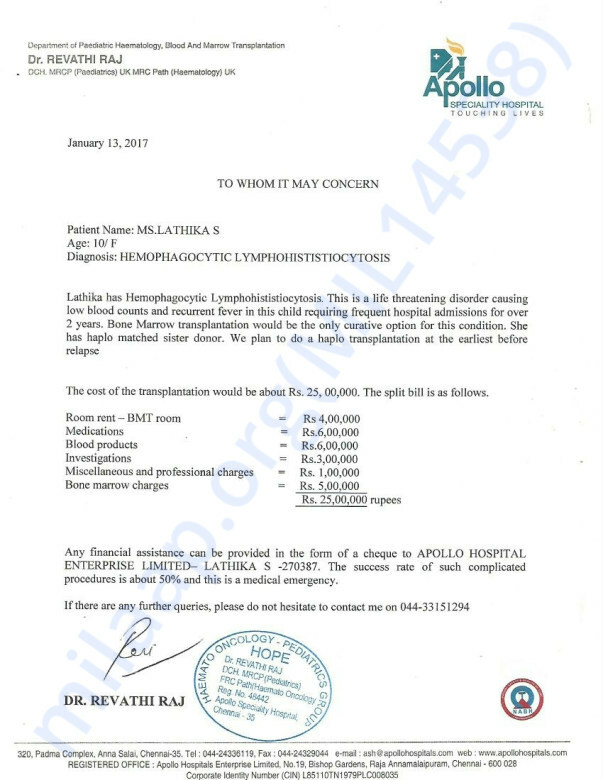 She had Hemophagocytic Lymphohistiocytosis and was getting treated for the same. The bone marrow transplant had also been performed and it was a success. In the past few days, she had developed mouth infections and she was being administered medication for the same. Unfortunately, her body was unable to take the stress. Your timely support ensured that she received the best medical care. The family is grateful for all the care and support you’ve shown Lathika. The past few weeks have been the most difficult ones for the family. We hope they find strength in this time of grief. May Lathika’s soul find peace. Please keep the family in your prayers. Thank you for all the support. 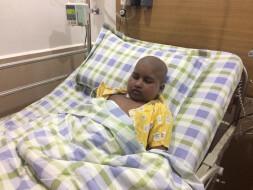 Lathika is now over 100 days after a successful bone marrow transplantation. Unfortunately, she has suffered a few setbacks with seizures and jaundice. These unexpected complications have resulted in hospital expenses that the family has not anticipated. They are focusing on providing the close care she needs including clean food, clean environment and medications to help prevent infections. We are appealing to well wishers to come to our aid again for another 250,000 rupees to help complete her treatment. We have a great news to share. Lathika is recovering really well. Your contribution has saved her and her family. Thank you for the timely support. The family has shared their heartfelt gratitude to each of you. They were caught up with various procedures related to her bone marrow transplant and have apologised for the delay in sharing this news. She will continue to be under observation and medication for a few more months till she is completely recovered. She is eating well and is active. Your support made this happen. Thank you once again. We will keep you posted on her progress.